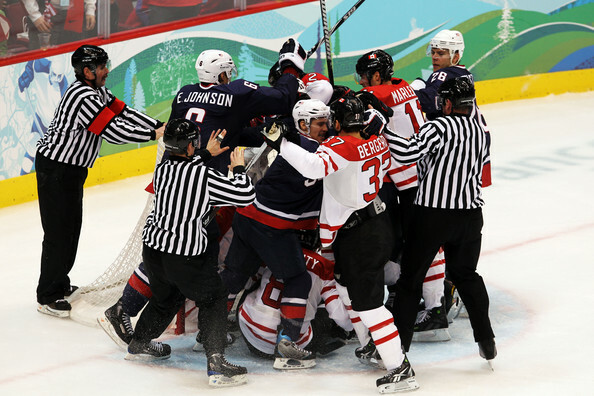 The Bronze Medal Match always features two teams who would rather be somewhere else — in the Gold Medal Game, specifically. 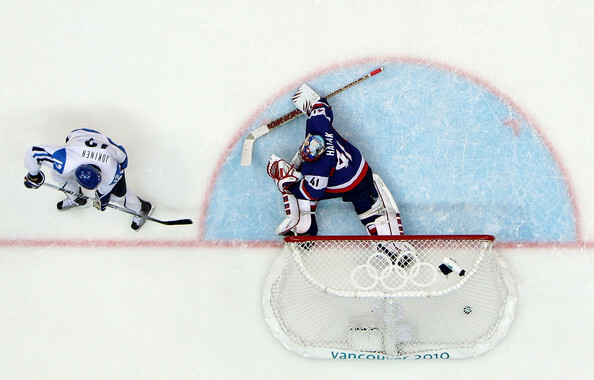 Nevertheless, both FINLAND and SLOVAKIA had all to play for in the contest for third place at the 2010 Winter Olympic Games in Vancouver, Canada. 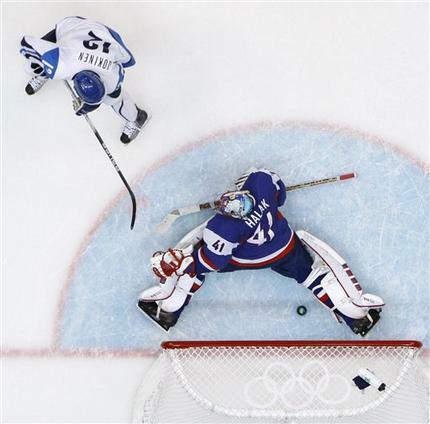 Finland, the runners-up four years ago in Turin, took the ice with the chance for a fourth Olympic medal the past five tournaments on offer; the Slovaks, for their part, were seeking the first Olympic hardware in the nation’s hockey history. It would be the Finns to strike first after the scoring champion from the 1994 Lillehammer Games, Slovakia’s ZIGMUND PALFFY of HK 36 Skalica, was sent of for holding late in the opening period. 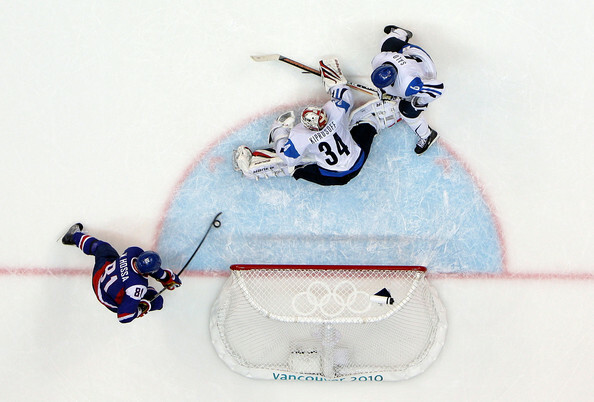 Finnish defenseman SAMI SALO of the Olympic host city’s Vancouver Canucks then blasted a shot from the top of the right circle past Slovak goaltender JAROSLAV HALAK of the Montreal Canadiens with a little over a minute left until the first intermission. 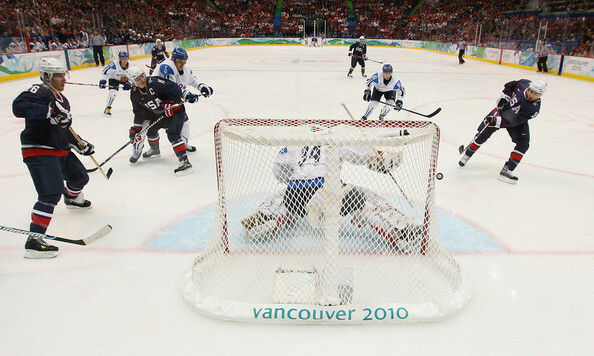 The chance had been created by the hustling play of Finland’s MIKKO KOIVU of the Minnesota Wild; Koivu successfully chased down Slovakia’s MICHAL HANDZUS just before the blueline in the offensive zone and jarred the puck loose with an effective check. Slovakia, handily outshot 12-5 over the initial twenty minutes, were able to regroup for the second session in large part due to the play of their special teams. 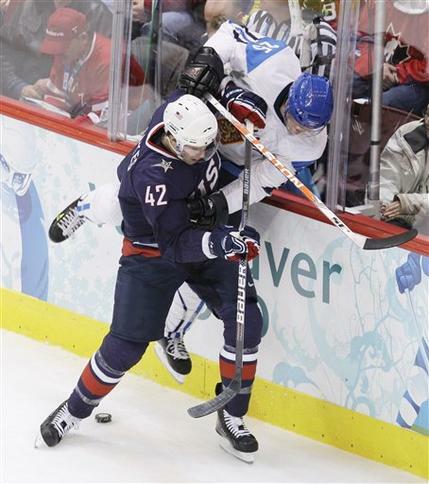 Four seconds from halfway point of the second period, Slovakia’s MARIAN GABORIK balanced the scoreboard. 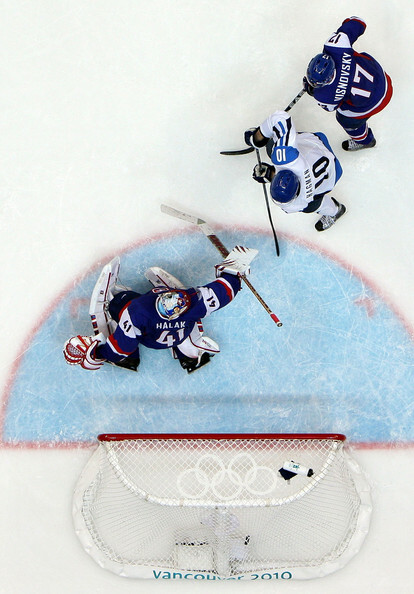 With the Slovakia on the man-advantage, Gaborik worked his way from the right circle into the slot to receive a pass from PAVOL DEMITRA. 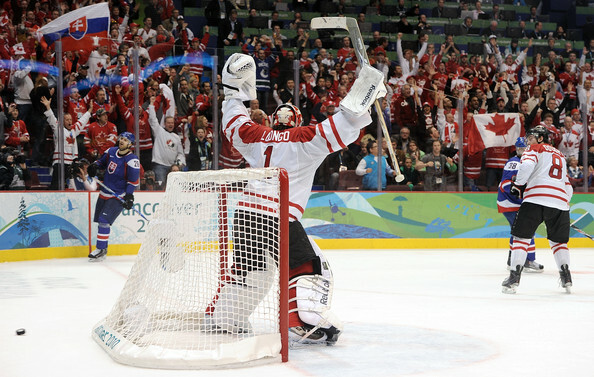 The New York Rangers sniper promptly proceeded to wrist the puck past Finland netminder MIIKKA KIPRUSOFF for his fourth goal of the 2010 Vancouver Games. With a little less than four and a half minutes left in the second stanza and this time operating on a two-man surplus, Slovakia again scored on the power play. 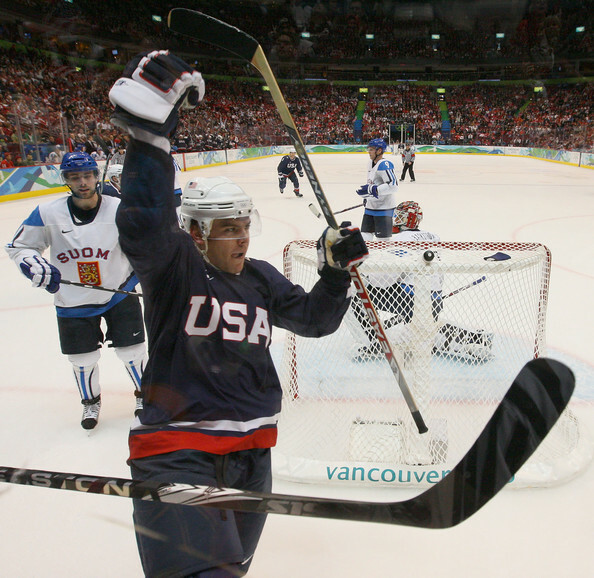 Having whiffed on his first attempt with a lucky find, Chicago Black Hawks forward MARIAN HOSSA kicked himself the puck for a second chance at the side of the net after the Los Angeles King Handzus had flubbed his shot from the slot. 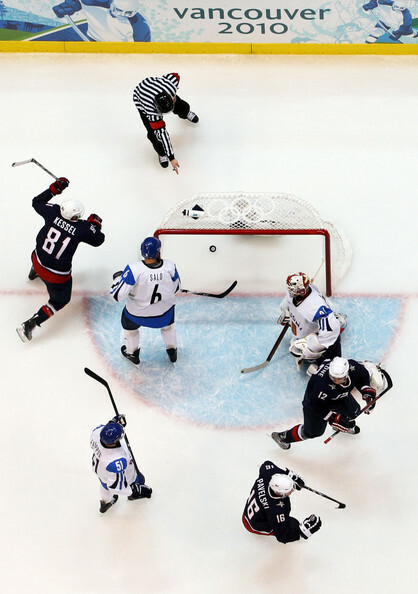 Slovakia surged to a 3-1 lead with 1:15 to be played in the second period when Hossa and Demitra went off on a two-on-one rush shorthanded. 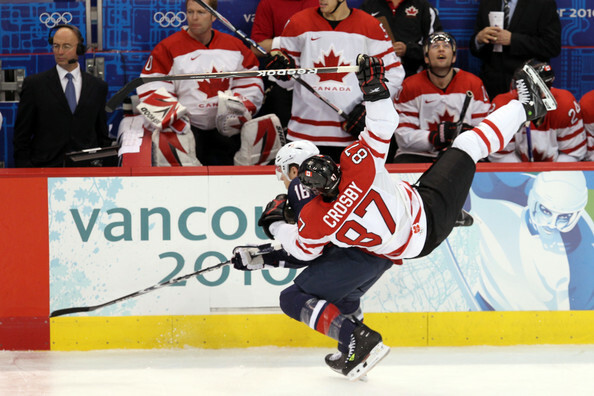 Hossa would hand Demitra a picture perfect saucer pass for the Olympic host city’s Vancouver Canuck to hammer behind Kiprusoff. Injured most of this National Hockey League season, the 35-year-old veteran had amassed just one goal and four points in 11 NHL games prior to the Vancouver Games. 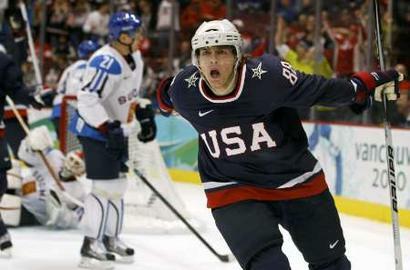 Demitra’s shorthanded goal raised his 2010 Olympic totals to three goals and ten points from seven games. 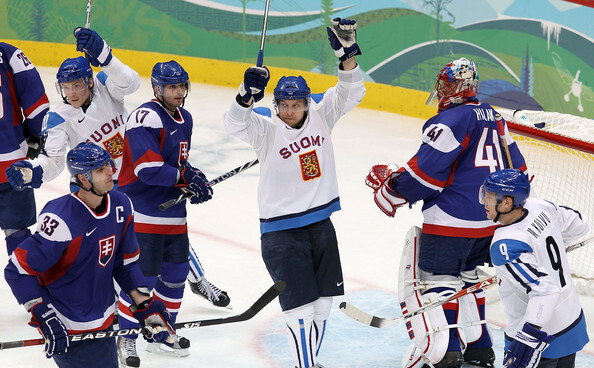 And so, Slovakia were a mere twenty minutes from their first-ever medal for ice hockey the Winter Olympics. 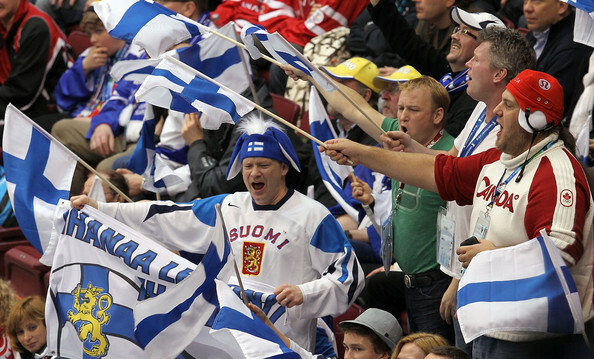 But, perhaps, the Finns featured too much interntional experience on staff to let the opportunity for a fourth Olympic medal from the last five tournaments at the Winter Games pass. 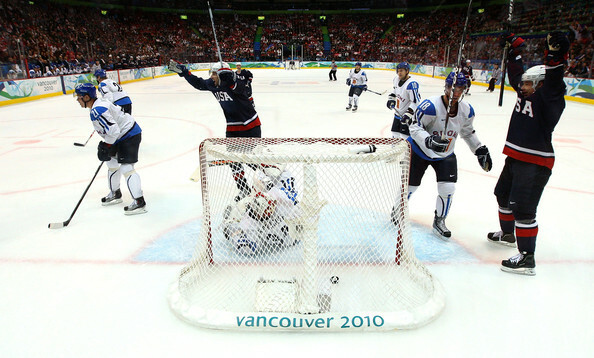 Calgary Flames forward NIKLAS HAGMAN ignited the comeback for Finland with his fourth goal of the 2010 Vancouver Games five minutes into the final period. With the Finns benefiting from a power play, Philadelphia Flyers defenseman KIMMO TIMONEN waltzed into the slot for a wrist shot Hagman redirected behind Halak. 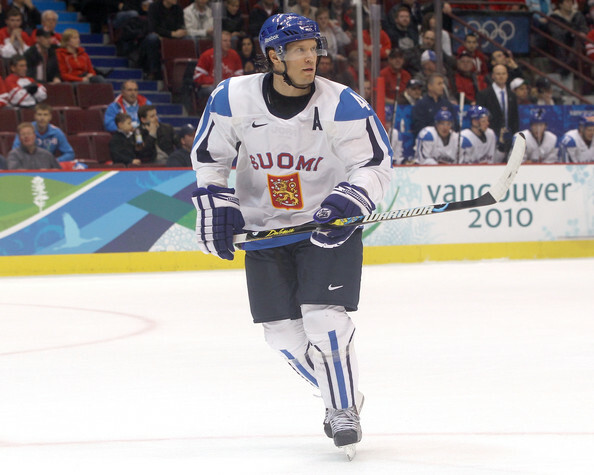 It would be the former Calgary Flames forward on his 106th appearance for Finland in a major international, OLLI JOKINEN, who stepped to the forefront to carry the torch for Suomi shortly thereafter. 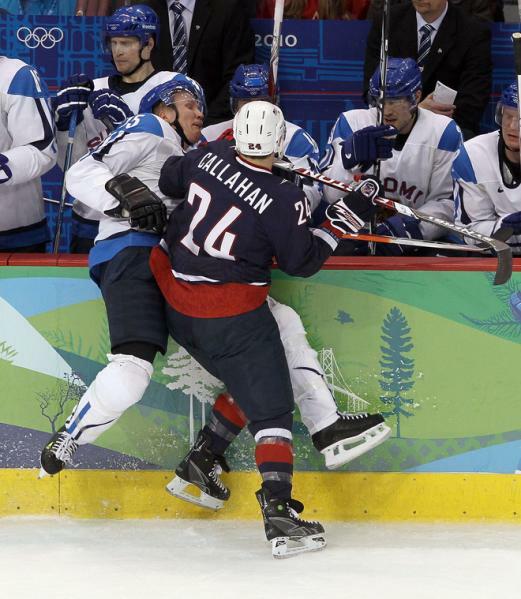 Roughly a minute and a half following Hagman’s marker, the newest New York Ranger received a pass from the Ottawa Senators’ JARKKO RUUTU in the slot and snapped a wrist shot past the stickside of Halak to draw Finland level. After Hossa had been boxed for tripping almost eight minutes into the final frame, Jokinen then received a precision pass from defenseman JONI PITKANEN of the Carolina Hurricane at the Slovak blueline. 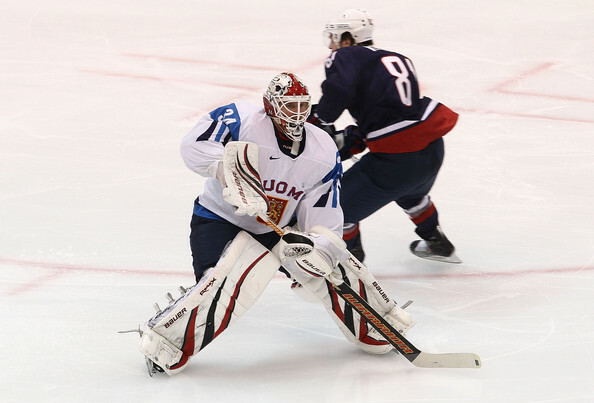 The 31-year-old quickly shed Slovkian rearguard LUBOMIR VISNOVSKY of the Edmonton Oilers to approach Halak unhindered. 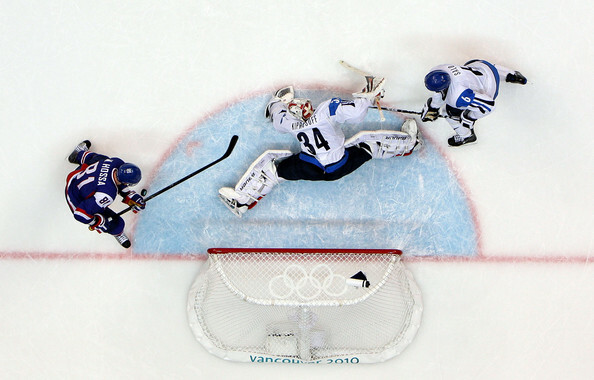 A textbook backhand goal, Jokinen’s third of the 2010 Vancouver Games and 32nd for Finland in a major international, left Halak helpless and would ultimately bring the set of bronze medals to Suomi. 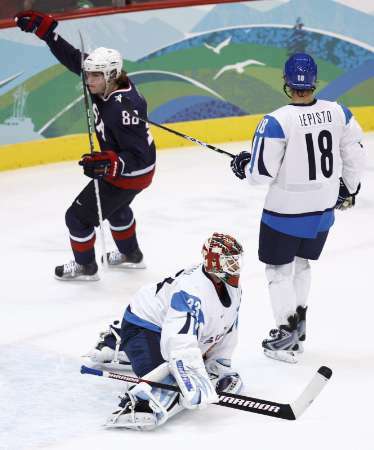 This after Kiprusoff rediscovered his form in the Finnish goal for the third period to stifle the Slovaks and VALTTERI FILPPULA of the Detroit Red Wings found the empty Slovak net with 11 seconds left for his third goal of this Olympic tournament. 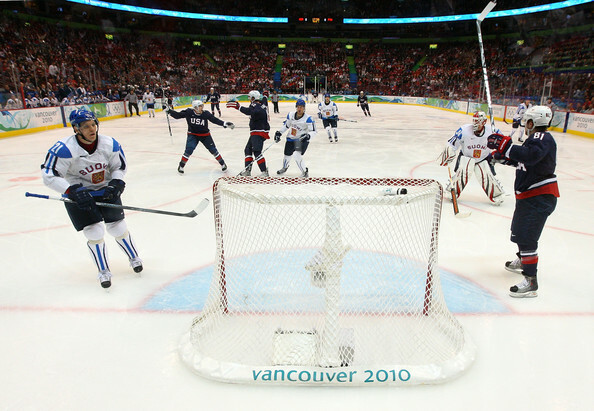 Both CANADA and SLOVAKIA had each lost to their neighbors and rival, the United States and the Czech Republic, respectively, in the round-robin at the Vancouver Games and yet recovered to reach the semifinals opposite one another at the 2010 Winter Olympics. 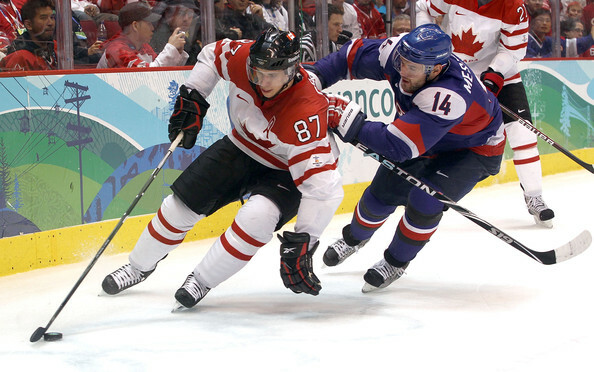 The very first time the two nations ever met, at the 1994 Winter Games in Lillehammer, Norway, the Slovaks actually upset Canada 3-1 in the round-robin on their debut at a major international tournament; that was before the National Hockey League would shut down to so as to let it’s players participate at the Olympics, however. 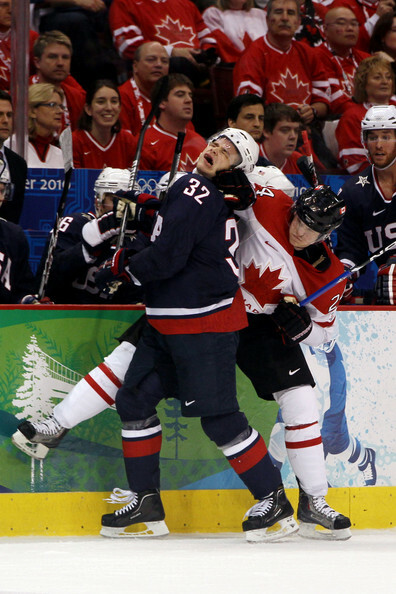 Canada obviously had answered some sort of wake-up call after their loss to the Americans. 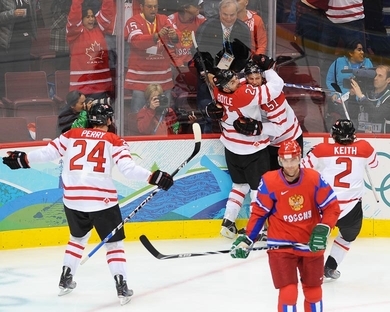 The Canucks proceeded to pound Germany 8-2 then dust Russia 7-3 on their way to the semifinals at Canada Hockey Place. 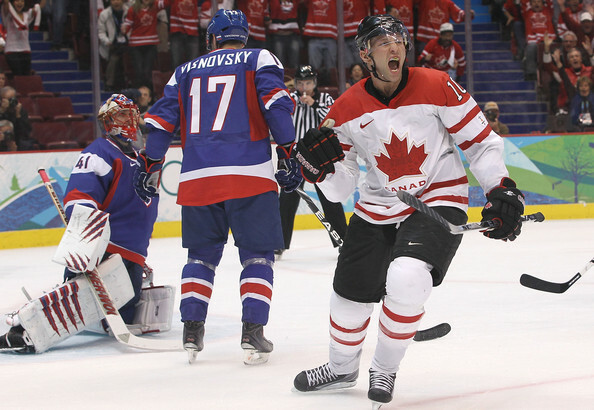 For the first forty or so minutes against Slovakia, Canada continued to be in complete command and on course to fulfill their mission in Vancouver. 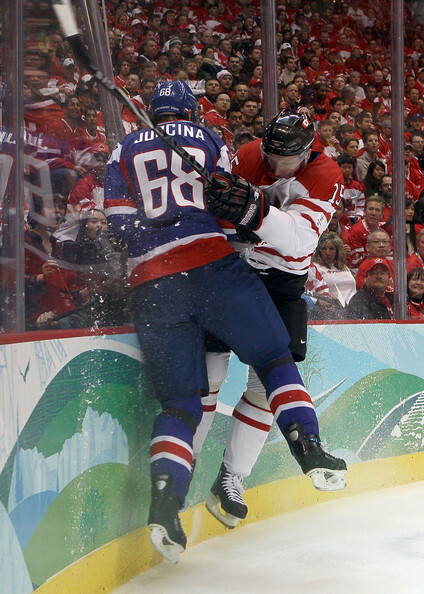 Canada struck for two goals in the opening period. Thirteen and a half minutes in, after fine work from San Jose Sharks star DANY HEATLEY, his NHL teammate, PATRICK MARLEAU, tipped the right point shot from Nashville Predators defenseman SHEA WEBER down and past Slovak goaltender JAROSLAV HALAK of the Montreal Canadiens. Halak protested a high stick from Marleau but the goal survived scrutiny. Less than two minutes later, Philadelphia Flyers defenseman CHRIS PRONGER’s wrist shot from the left point was deflected by Dallas Stars forward BRENDEN MORROW past Halak for the 2-0 lead. 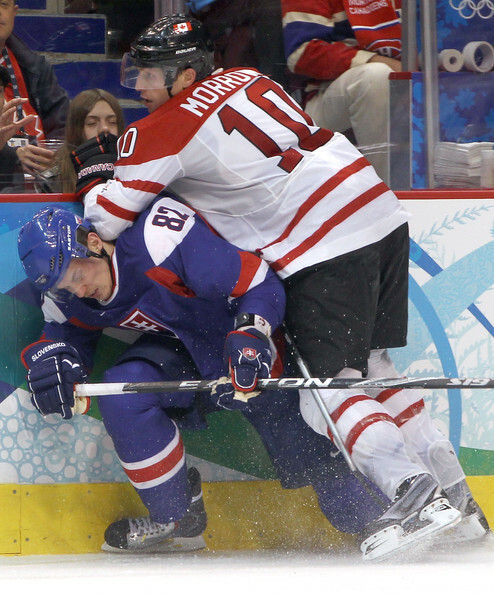 Canada controlled play for the first two periods as the Slovaks were content to conservatively absorb pressure and play for the counterattack; the Canadians counted a 21-9 lead in shots-on-goal for the first forty minutes. 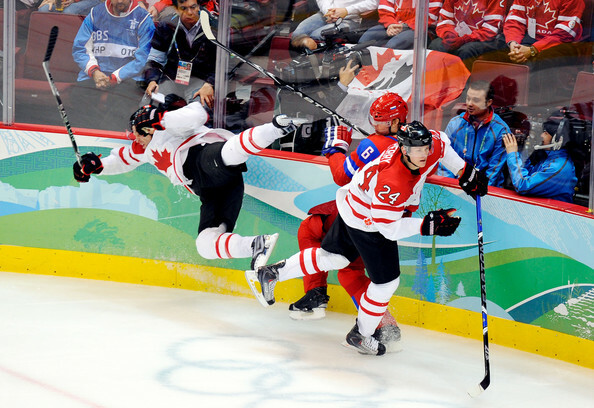 Late in the second period, Canada would extend the score to 3-0 on the power play with just over three minutes to go in the second period. Anaheim Ducks forward COREY PERRY let go a wrist shot from the top of the left circle which was halted by Halak, but Perry’s teammate RYAN GETZLAFF, while falling to his knees, backhanded the puck top shelf for what would prove to be a critical goal. 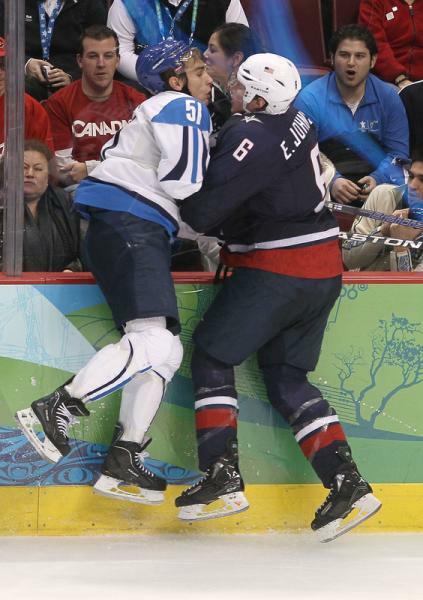 Slovak captain and defenseman ZDENO CHARA of the Boston Bruins had been left with both Getzlaff as well as Morrow to contend with in front. 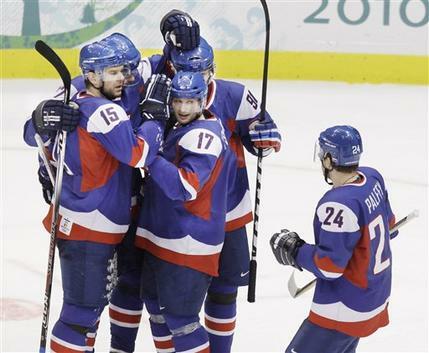 While Canada were appearing in the semifinals for the third time in four Olympic tournaments, the Slovaks, meanwhile, had never progressed this far at the Winter Olympics before. In the final twenty minutes, the Slovaks clearly attempted to make the most of their chance. 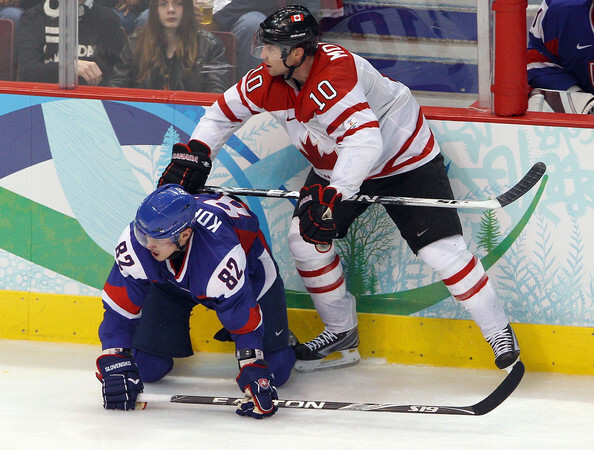 A little past the halfway point of the third period, Edmonton Oilers defenseman LUBOMIR VISNOVSKY, on his 76th career appearance at a major international tournament for Slovakia, made an outstanding play to keep the puck in the zone at the Canadian blueline. 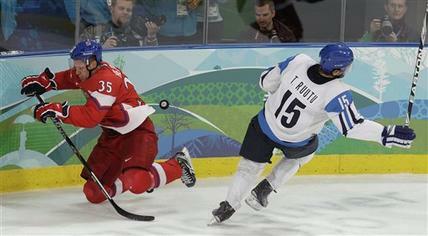 Visnovsky immediately thereafter rounded Getzlaff and raced down the right wing. 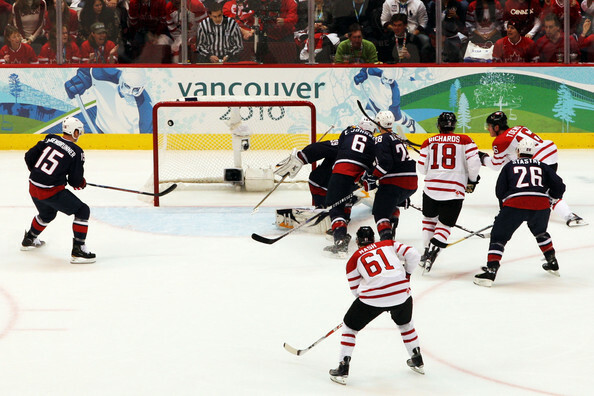 The 33-year-old rearguard centered the puck upon reaching the goal line and put Slovakia on the board when the black disc was deflected behind ROBERTO LUONGO of the Vancouver Canucks into Canada’s goal. With just under five minutes remaining in the match, Slovakia drew to within one of the host nation. Veteran NHLer RICHARD ZEDNIK of Russian club Torpedo Yaroslavl, after fine work with the puck on the cycle behind the Canadian goal, circled out front for a backhand attempt at Luongo, who made the save. 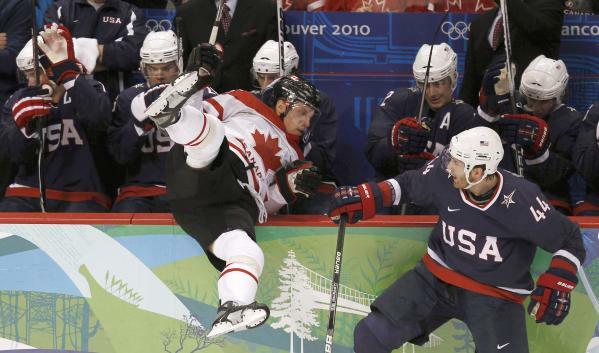 Standing in front, however, was MICHAL HANDZUS of the Los Angeles Kings, who tapped the puck out of mid-air past Luongo into the top-shelf. 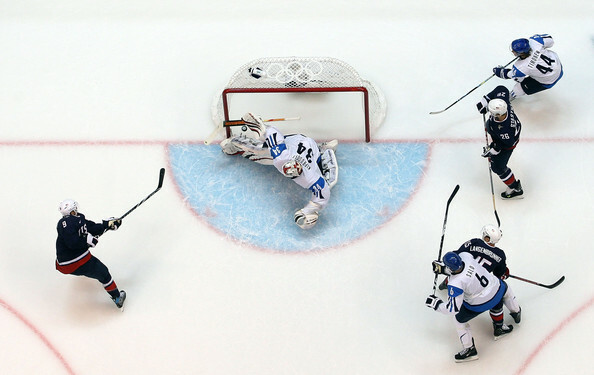 A tense finish followed as the Slovaks, who outshot Canada 12-7 in the final period, continued to press their attack. With Halak on the bench for an extra skater as well as dogged forechecking, Slovakia spent the entire final minute on the offensive in Canada’s zone. 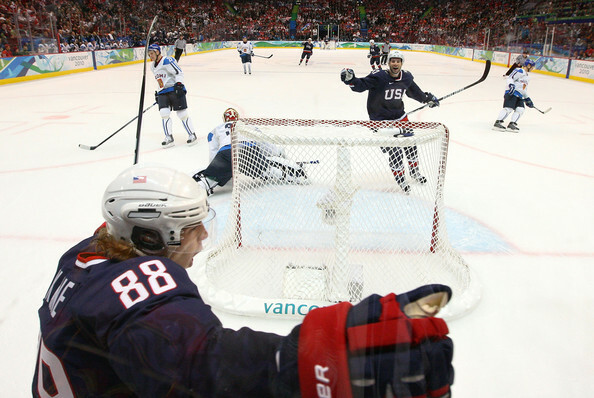 Chicago Black Hawks star MARIAN HOSSA’s wrist shot from the top of the right circle, after working its way through traffic in front, found itself on the stick of PAVEL DEMITRA of the host city Vancouver Canucks at the right side of the net. 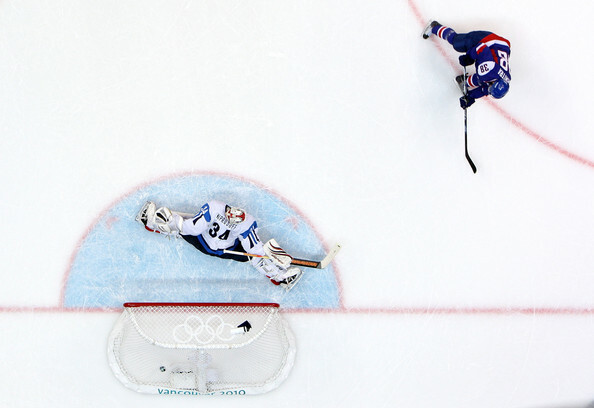 With Luongo out of position and the net looming large, however, Demitra missed the mark with Slovakia’s last opportunity. 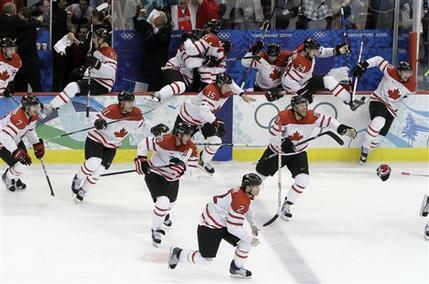 Breathing a collective sigh of relief, Canada advanced to the Gold Medal Match for the second time in three Olympic tournaments. 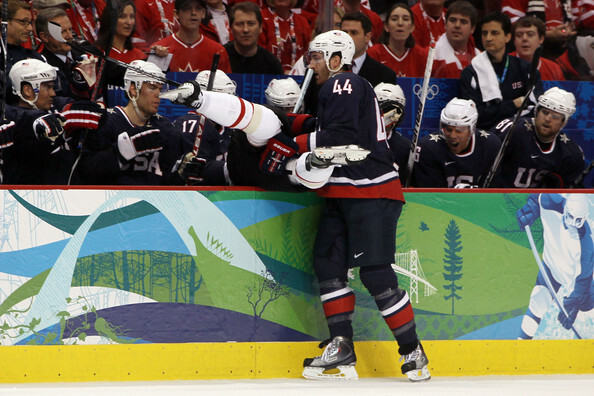 RYAN GETZLAFF (51), on his knees, raises his stick to signify his backhand shot which has beaten Halak. 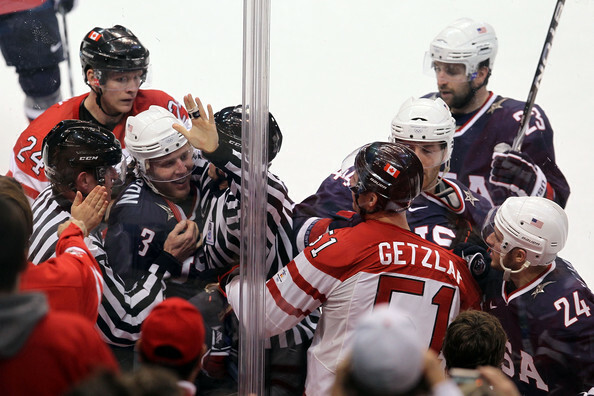 Getzlaff’s goal, his third of the Olympic tournament, will ultimately provide Canada its passage to the Gold Medal Game at the Winter Games in Vancouver. (Harry How/Getty Images). 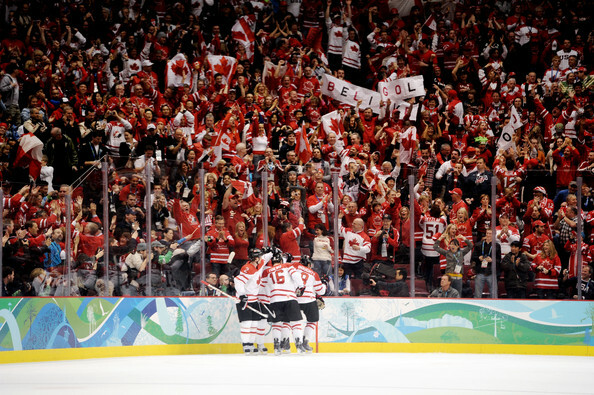 For all the skill and experience found on the rosters of both SLOVAKIA and SWEDEN, not to mention ice hockey history between the two nations involved, it was only appropriate that the very last quarterfinal match at the 2010 Winter Games in Vancouver should feature a lively and entertaining affair settled by a solitary score. 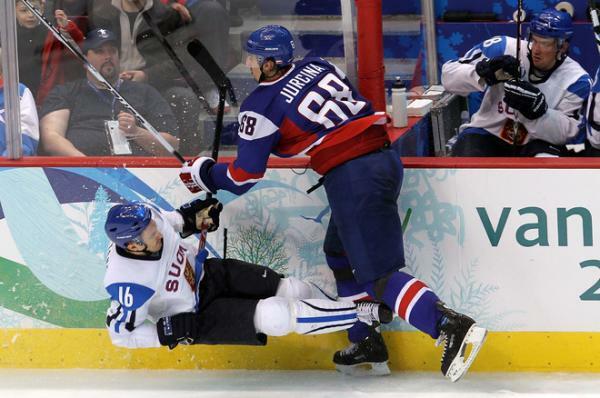 Following a scoreless and evenly-played first period, the Slovaks drew first blood after the defending Olympic champions took a penalty for too many players seven and a half minutes into the second session. 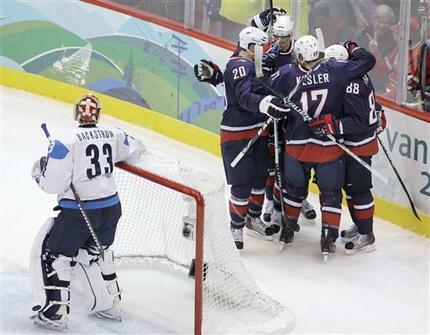 Capitalizing on the power play, Slovakia’s Chicago Black Hawks star MARIAN HOSSA handed MARIAN GABORIK a perfect, cross-ice pass for the New York Rangers star to one-time past his National Hockey League teammate, HENRIK LUNDQVIST, in the Swedish goal. Less than a minute later, the Slovaks surprisingly scored yet again. Intercepting a pass in his own defensive zone, Slovakia’s aging ZIGMUND PALFFY of HK 36 Skalica sent Torpedo Yaroslavl’s RICHARD ZEDNIK away on a rush. Palffy paid the price and received a devastating hit, but the former NHL scoring star’s quick pass had been huge. The NHL veteran Zednik sped into the Swedish zone down the right, drew the lone defender and cut the puck across for defenseman ANDREJ SEKERA of the Buffalo Sabres to shoot past Lundqvist. Sweden held a wide 12-4 lead in shots-on-goal for the second period and would respond, however, with the leadership of a veteran. 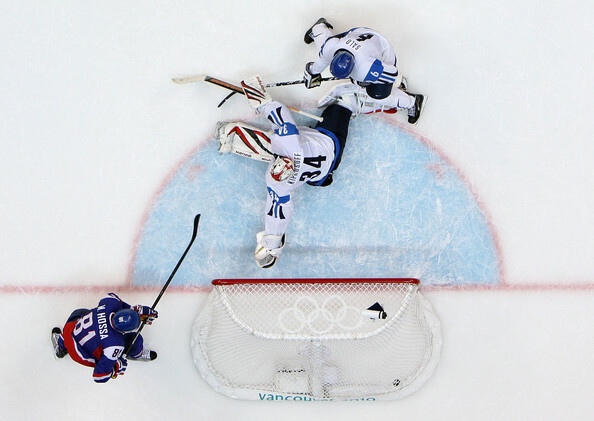 The 37-year-old, two-time Olympic gold medalist PETER FORSBERG of Mo Do Ornskoldsvik, with a backhand flip from behind the goal, found PATRIC HORNQVIST of the Nashville Preadators in front. 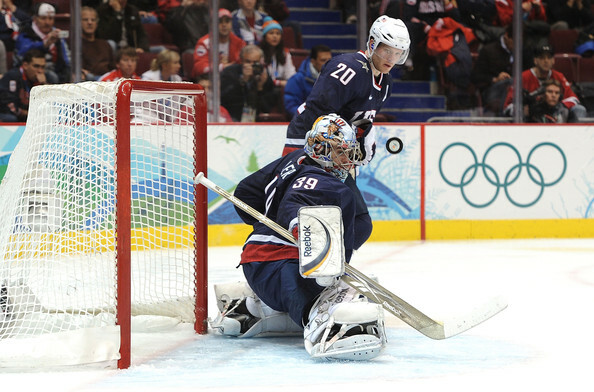 With a backhand of his own past Slovak goaltender JAROSLAV HALAK of the Montreal Canadiens, the 22-year-old Hornqvist halfed Slovakia’s lead. 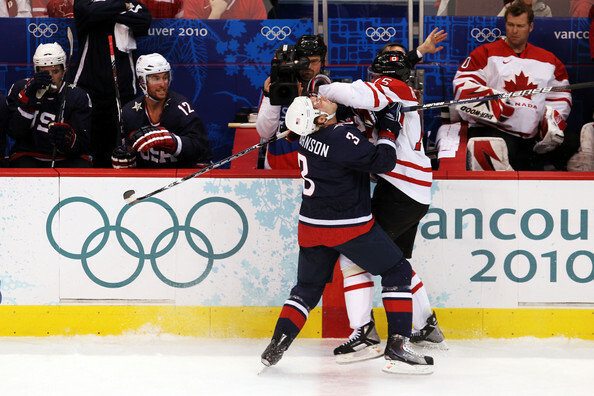 Almost immediately thereafter, with Forsberg steaming for the net, Detroit Red Wings star HENRIK ZETTERBERG had his centering pass deflect off Slovak defenseman MILAN JURCINA in front past Halak to pull Sweden level at 2-2 with five and a half minutes remaining until the second intermission. 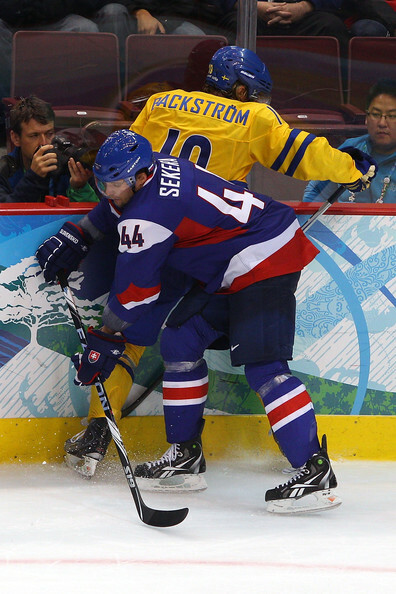 Unfortunately for Sweden, Atlanta Thrashers defenseman TOBIAS ENSTROM took a penalty for tripping with less than two minutes to go and Slovakia promptly scored. 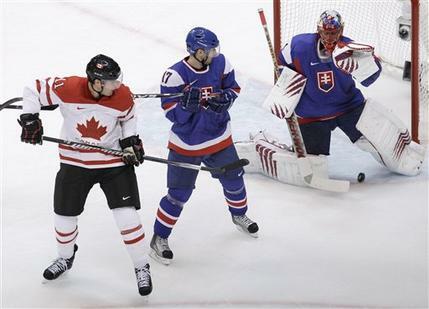 PAVOL DEMITRA of the Olympic host city’s Vancouver Canucks, who produced the shootout winner for Slovakia versus Russia earlier in the tournament, struck again. 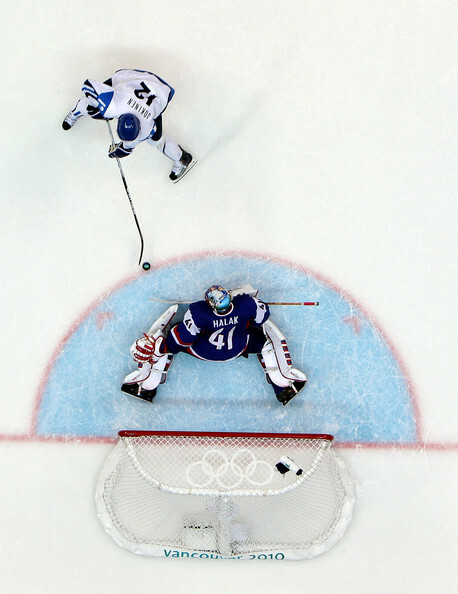 The 35-year-old wing, who has missed most of this NHL season due to injury, cannoned a slapshot from the top of the left face-off circle over Lundqvist’s shoulder to send Slovakia back in front just before the break. 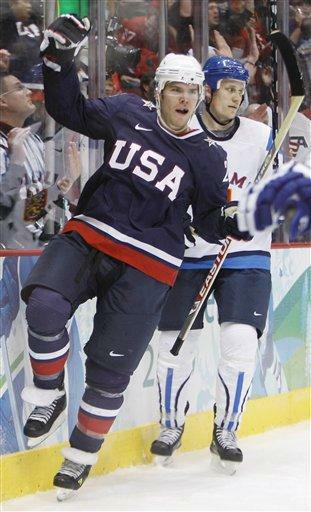 Nine minutes into the final frame, Slovakia again went up by two thanks to a goal from the unlikely TOMAS KOPECKY of the Chicago Black Hawks. 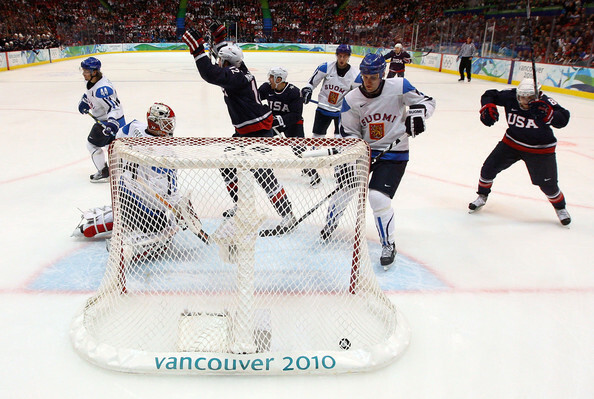 Demitra and Marian Hossa broke into the zone on a two-one-one break; Kopecky slid his Chicago teammate’s rebound past the prone Lundqvist for his first goal at the Vancouver Games. Kopecky has four goals in 58 NHL games for the Black Hawks this winter. 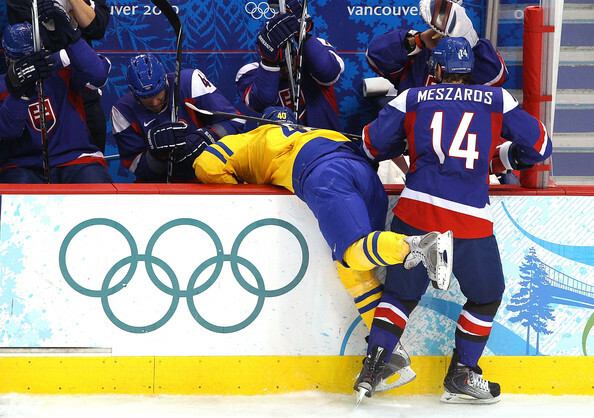 Veteran DANIEL ALFREDSSON of the Ottawa Senators managed to draw the Swedes within one less than a minute later to set the stage for a tense and dramatic finish as Sweden pressed their attack. 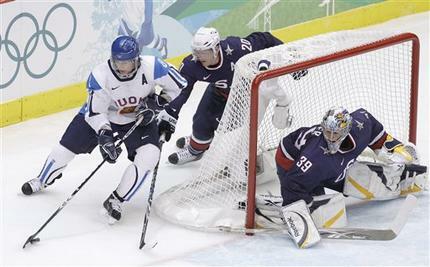 Indeed, the Swedes posted a lopsided 29-14 shots-on-goal total for the contest. 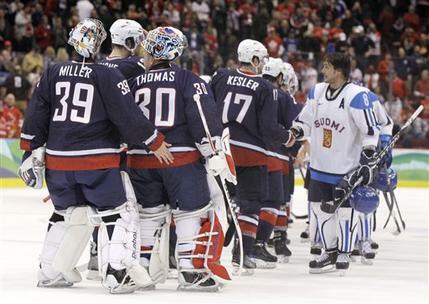 But, Halak and the Slovaks were able to hang on for the victory and a place in the semifinals at the 2010 Winter Olympics. 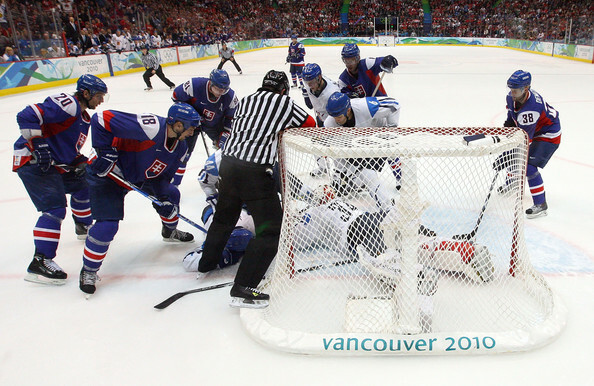 Slovakia, who failed to get past the preliminary stage at both the 1998 Nagano Games and the 2002 Salt Lake City Games, have reached the medal round for the very first time in Vancouver. 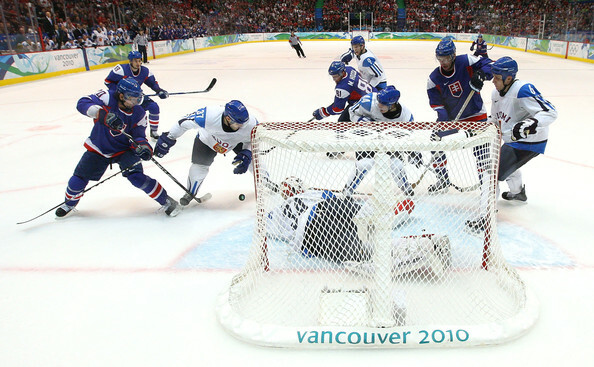 Both the CZECH REPUBLIC and FINLAND brought offensive ability to the University of British Columbia Thunderbird Arena for their quarterfinal match at the 2010 Winter Olympic Games in Vancouver, Canada. 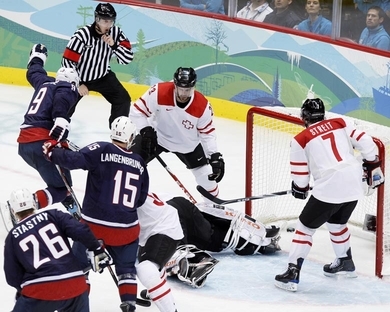 What materialized in the midst of the pressures associated with the Olympic tournament was a defensive struggle featuring a good, old-fashioned goaltender’s duel between Finland’s MIIKKA KIPRUSOFF of the Calgary Flames and the Czech Republic’s TOMAS VOKOUN of the Florida Panthers. The game, at least statistically, was quite evenly contested. The first period would have the Finns finish with an 11-10 edge in shots-on-goal. 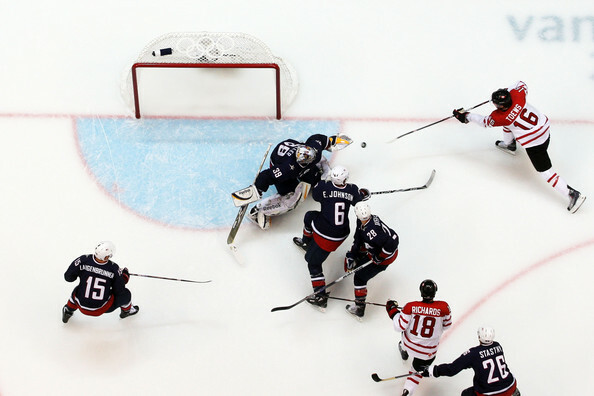 The second session would have that same result reversed in favor of the Czechs. Indeed, for the whole sixty minutes, each time would generate a matching thirty-one shots upon one another’s goal. Five minor penalties to the Czech Republic in the first period meant star forward JAROMIR JAGR of Russian club Avangard Omsk saw just 2:08 of ice time from coach VLADIMIR RUZICKA in the opening twenty minutes. 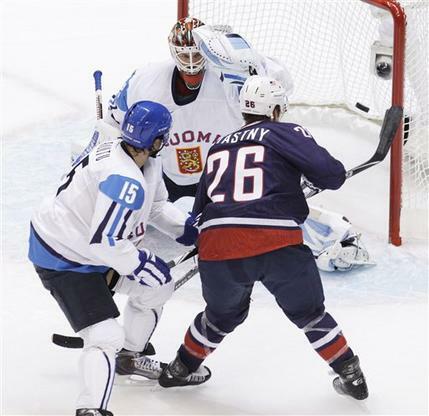 Finland, however, failed to take advantage of its power play opportunities with solid penalty-killing and Vokoun in net carrying the Czechs. In the second period, the Czech Republic did better to avoid the wrath of the referees and organize more attacks but found Kiprusoff to be in fine form for the Finns. 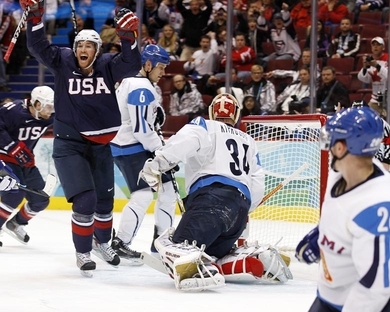 After 52 minutes of scoreless hockey, Finland finally broke the stalemate after the Czech Republic’s MARTIN ERAT of the Nashville Predators was sent to the penalty box. Already a man down, the Czechs had their problems compounded in short order. Critically, Finnish forward NIKLAS HAGMAN of the Calgary Flames was left alone in front when defenseman JANNE NISKALA of Swedish club HC Vastra Frolunda Goteborg let go his slapshot from the Finnish point. 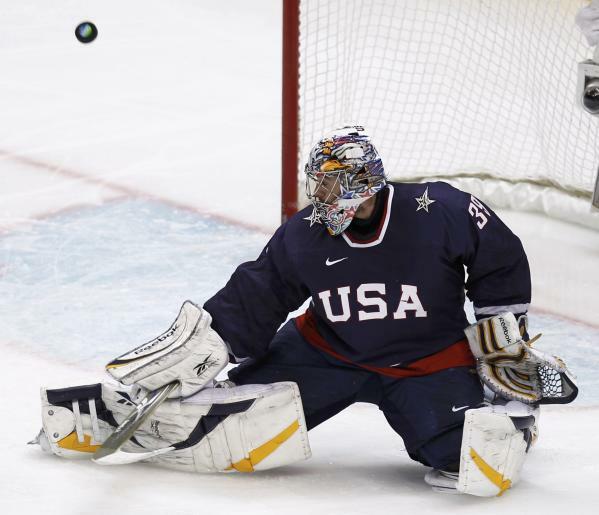 Hagman, the son of the first Finn to ever play in the National Hockey League, redirected the puck through Vokoun’s five-hole for the game’s first goal. 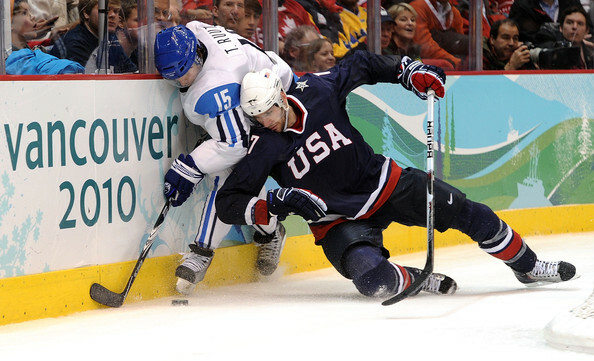 For Hagman, it marked his third goal in four games for Finland at the 2010 Vancouver Olympics. The Czech Republic defenseman PAVEL KUBINA of the Atlanta Flames had been at the center of it all. 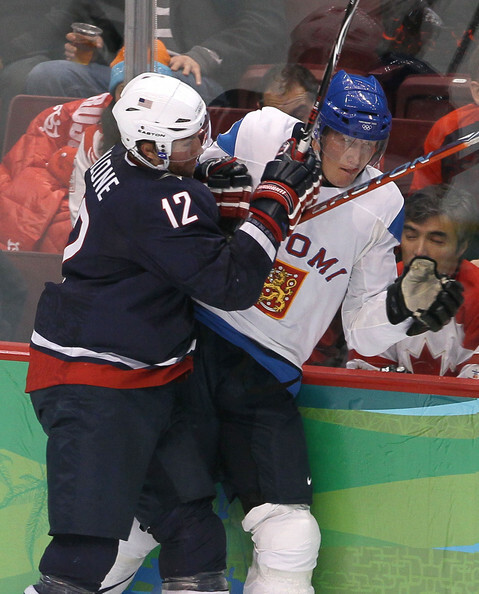 Kubina had lost his helmet in a collision with Hagman, who had started the play with a rush into the Czech zone. Shortly before Niskala discharged his shot, Kubina, realizing he had no headgear, suddenly left Hagman to collect his helmet behind the net. 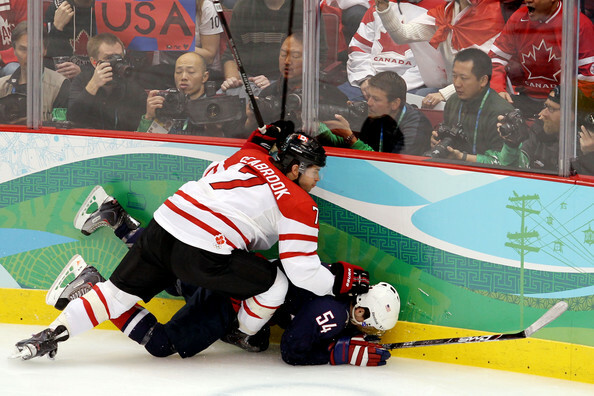 “It was tough luck for us, because the defenseman lost his helmet and he had to go pick it up. 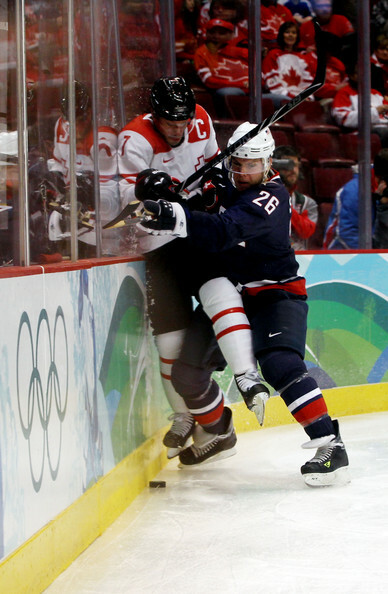 But, that’s a part of the game,” Jagr later reflected. 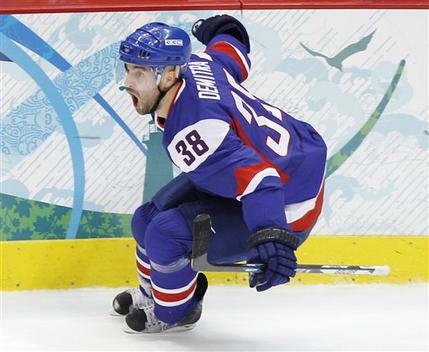 In the 59th minute, Finland’s VALTTERI FILPPULA of the Detroit Red Wings effectively killed off the Czechs’ last chance with an empty-net goal seven seconds after Vokoun had gone to the bench for an extra attacker. Two goals eleven minutes and six seconds into the contest seemed to send some sort of signal the CZECH REPUBLIC were in for a training game against LATVIA in the qualification round at the 2010 Winter Olympics in Vancouver. First, with the Czechs on the power play, TOMAS ROLINEK of Russian club Metallurg Magnitogorsk backhanded the rebound from Ottawa Senators defenseman FILIP KUBA’s point shot behind Latvia goaltender EDGARS MASALSKIS of Dynamo Riga just before the six minute mark. Then, TOMAS FLEISCHMANN of the Washington Capitals wristed a shot from the slot past Masalskis after a fine setup from Boston Bruins forward DAVID KREJCI, who had taken the puck after fine board work from teammate ROMAN CERVENKA of Slavia Prague behind the net. 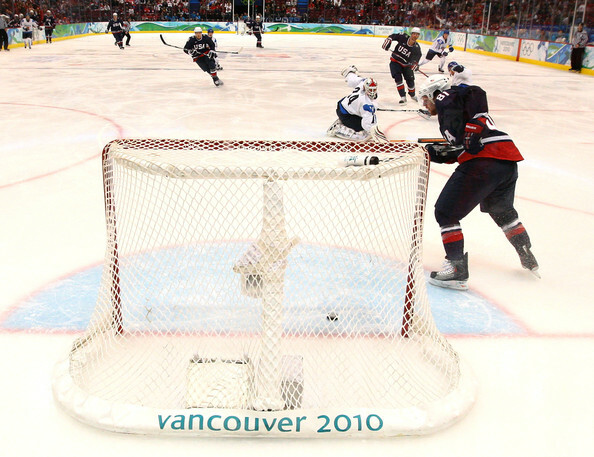 But Masalskis, who would finish the game with 48 saves, immediately thereafter slammed the door on the Czech Republic for the remainder of regulation play in what was easily the 29-year-old veteran Latvian international’s best effort at the 2010 Vancouver Games. Meanwhile, the scrappy but heavily outshot Latvians continued to skate and play for a break. Such opportunity arrived with eight minutes left in the match when a centered puck from Lativa’s ALEKSANDRS NIZIVIJS skipped to MARTINS CIPULIS in the slot. The 29-year-old Dynamo Riga forward quickly whacked the disc past Czech goaltender TOMAS VOKOUN of the Florida Panthers to cut the Latvian deficit in half. Suitably energized and the beneficiaries of a bit of good fortune, Latvia pulled level tunate bounce with less than four minutes remaining in regulation. The well-traveled ARMANDS BERZINS, a Minnesota Wild draft pick, saw his one-timer from the slot miss the net but bounce off the boards straight to Dynamo Riga’s MIKELIS REDLIHS at the side of the net. 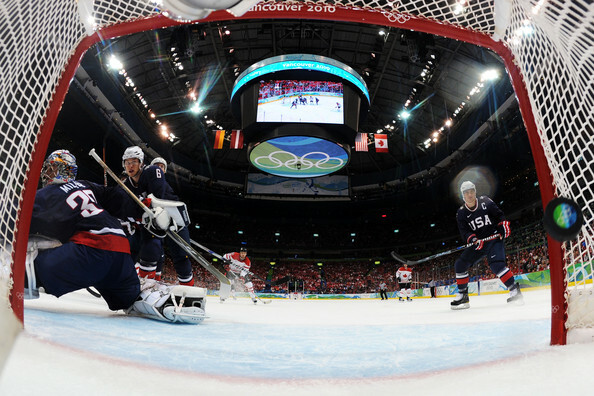 The 25-year-old forward was able to bundle the biscuit into the back of the net and lift Latvia to a remarkable 2-2 draw. And, thus, extra time was required. A little more than halfway through the overtime session, the Czech Republic booked their passage into the quarterfinal round. Krejci collected a drop pass from Fleischmann in the offensive zone and, after faking the slapshot, cut to his right to shoot between Masalskis’ legs for the game-winning-goal. The Czechs could breathe a collective sigh of relief.